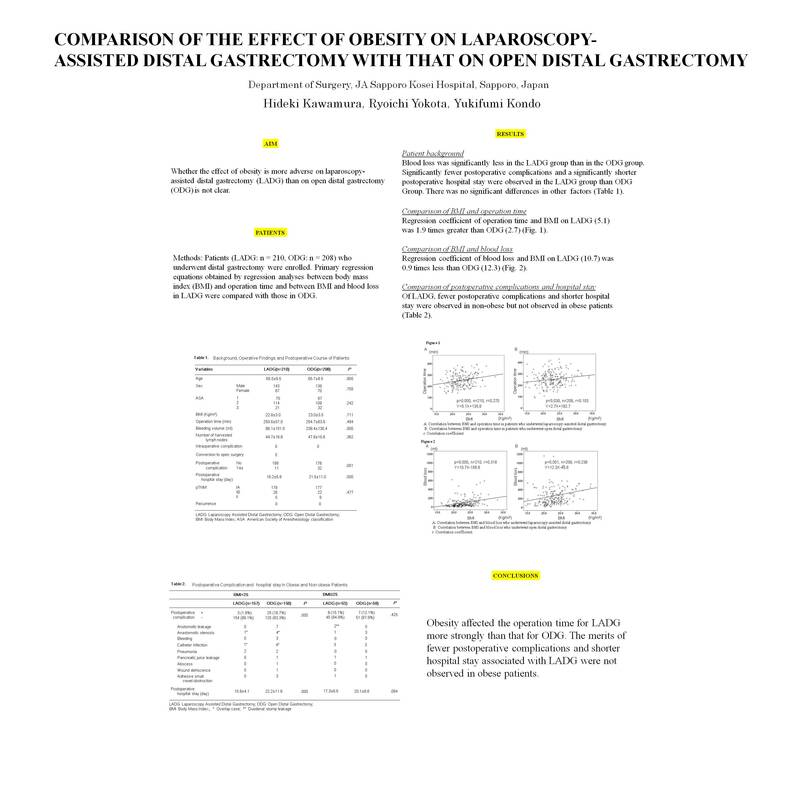 INTRODUCTION: Whether the effect of obesity is more adverse on laparoscopy-assisted distal gastrectomy (LADG) than on open distal gastrectomy (ODG) is not clear. METHODS: Patients (LADG: n = 210, ODG: n = 208) who underwent distal gastrectomy were enrolled. Primary regression equations obtained by regression analyses between body mass index (BMI) and operation time and between BMI and blood loss in LADG were compared with those in ODG. RESULTS: Regression coefficient of operation time and BMI on LADG (5.1) was 1.9 times greater than ODG (2.7). Regression coefficient of blood loss and BMI on LADG (10.7) was 0.9 times less than ODG (12.3). Of LADG, fewer postoperative complications and shorter hospital stay were observed in non-obese but not observed in obese patients. Conclusion: Obesity affected the operation time for LADG more strongly than that for ODG. The merits of fewer postoperative complications and shorter hospital stay associated with LADG were not observed in obese patients.